I wanted Christa to paint me at work, so we found a date when the birthday boy wasn’t going to be around (he works just next door), and she pitched up at the Let Fire Inspire workshop with her gear. I was absolutely beside myself with nervousness about it when she arrived (‘what am I DOING?’, ‘this feels really weird’ and ‘I feel I must be really vain, doing this’ were some of the things I gabbled in welcome) but we had a cup of coffee and a chat while Christa set up her easel and filled her water pots. It was an absolutely enthralling morning, and an incredible experience. We had identified that the best part of the beadmaking process for Christa to show was the winding of the glass, and I picked my favourite transparent green for the purpose. I sat and wound bead after bead at the torch flame, and put all other thoughts aside. I was at work. Christa was at work. And we were both doing what we loved. Rather nice, I thought. I made beads and Christa painted for about three quarters of an hour. She told me that she was done, and wanted to show me the painting. I stalled her for at least five minutes on this one, finding every excuse in the book NOT to have a look. I think I was terrified! But then I looked. And burst into tears. I was absolutely blown away that she’d captured me - in paint, absolutely 100% - being me at the torch flame, letting fire inspire. She gave me a hug. Renowned artist and illustrator Christa Hook has created military artwork, book illustrations, portraits, watercolours and natural history paintings. Weekly life-drawing ‘since forever’ gives her confidence and expertise in drawing with paint for her watercolour portraits, and she tells me that she was never not going to be an artist. It certainly comes across both in her work and in her approach to it - this girl has paint coursing through her veins. 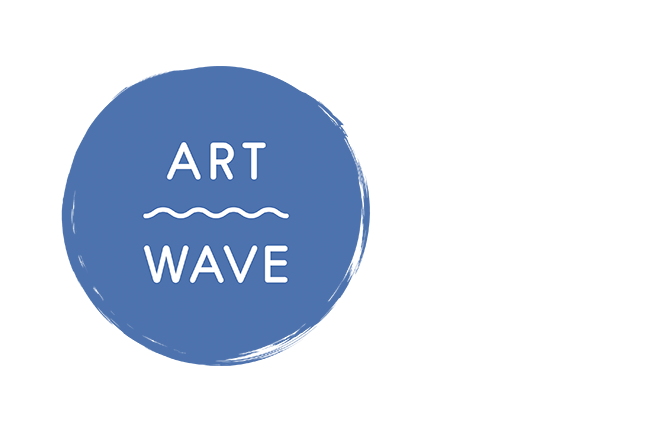 Depot Cinema in Pinwell Road, Lewes, is hosting 'Blue at Depot: Open Exhibition' during Artwave Festival. Submissions were invited from local artists of all ages and levels of experience, and the result is a fabulously cohesive, thought-provoking, beam-inducing exhibition of remarkably accomplished and diverse art across a variety of media. It's well worth a visit! I'm delighted that my glass bead bracelet was selected for inclusion in the exhibition, and I very much enjoyed my visit to the Private View yesterday evening. 'Beachy Head' by Rebecca Motley: linocut. You can visit Blue at Depot on Sunday 19th August, Saturday & Sunday 25th & 26th August, and Saturday & Sunday 1st & 2nd September. Depot is a delightful Lewes highlight, having recently won the acclaim of Tourist Destination of the Year (LDBA Awards 2018). It bills itself as 'Depot: Cinema & More' and has plenty to offer visitors! Why not go along to check it out?